When you use the Display Names addon, and someone unsubscribes from your mailing, they will see the lists that they are a member of, that you have enabled Display Names for. When you have Display Names activated, firstly GoDaddy Email Marketing unsubscribes the contact from all lists -- it is just the polite thing to do! Then, its up to your contact to jump back in to an active list, if they wish. 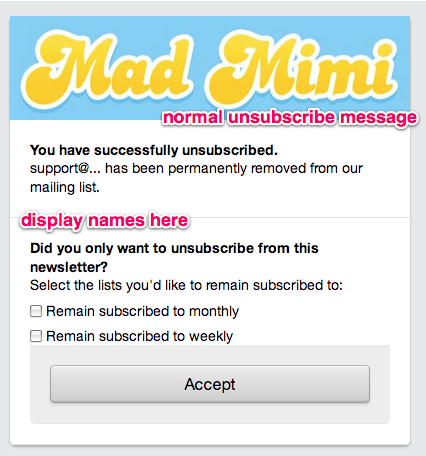 And if a contact only belongs to one list, that contact will just see a normal unsubscribe page. Since there's no option for another list, anyway. When I tick the box next to the list name, and then click Accept, I'll be added back to that list. Read all about the Display Names feature.